PATNA: Angry villagers on Wednesday lynched two persons to protest the killing of a Rashtriya Janata Dal (RJD) leader in Bihar, resulting in heavy deployment of security forces at the site to defuse the prevailing tension. Reports quoting the police and local media said the victim identified as Indal Paswan was returning home late Tuesday night after joining a funeral procession when criminals shot him dead. The incident took place in Deepnagar police station areas of Nalanda district which is home district of chief minister Nitish Kumar. Reports said the victim had joined the RJD barely two days back. 3 people died due to Mob Lynchings in last 24 Hours. 7 Murders in last 24 hours. Law & Order is Out of Control in Bihar as Nitish govt is working Hand in Glove with Criminals. 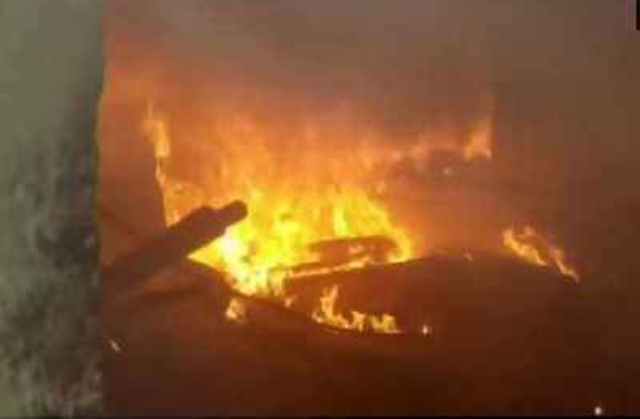 The incident triggered strong protests as the angry villagers raided the houses of two suspected murders in the neighbouring village and set them on fire. Job done, the mob took the suspected murders in their captivity and gave them a sound beating, injuring them critically. Both died soon thereafter, media reports said. Authorities have made adequate deployment of police at the affected village to calm down tension in the areas, reports said. विपक्षी पार्टियों के नेताओं की चुन-चुन कर हत्या हो रही है । आपके राज में हत्या, लूट, अपहरण, यौनाचार जैसी वारदातें तो आम हो चुकी है। कम से कम अपने गृह जिले को तो बचा लीजिए…. या 2020 के पहले ही #बिहार छोड़ने का मन है ? “He was shot dead due to personal enmity. We are investigating the case,” a senior local police official told the news agency ANI on Wednesday. The killings of political leaders and activists have become a matter of serious concern in Bihar. In the past eight months, around six Rashtriya Lok Samata Party (RLSP) leaders have been killed in Bihar.